ANT-MAN. Gotta admit, not a massive comic book fan, never heard of him. But, seeing how great Marvel have been in reviving properties and having loved GUARDIANS OF THE GALAXY despite no prior knowledge of the characters, I had high hopes. And with Paul Rudd cast in the lead role, I was expecting a similarly fun-filled, effects heavy action movie. But no. 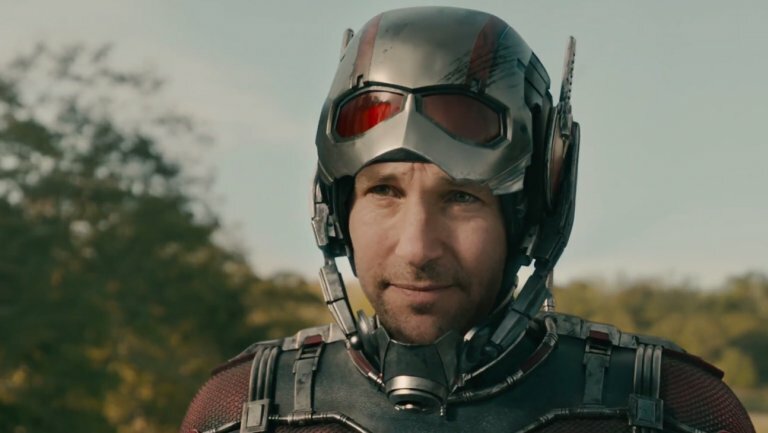 While ANT-MAN is certainly full of special effects and enhances and extends the Marvel Universe, it's the most unmemorable entry in the franchise. This is actually quite an achievement given that it stars Michael Douglas who retains his charisma. But the problem is that the movie just isn't funny - and in not being funny it wastes Paul Rudd. Worse still, the movie isn't interesting. It feels like it's being played exactly by the book with nothing new, nothing subversive, no real chemistry between any of the characters. All of this made sense when I recalled that ANT-MAN was originally meant to be written and directed by Edgar Wright - a script that Joss Whedon called the best Marvel movie ever. Well, there it is. I can't review a movie I didn't watch. So here's the ANT-MAN we actually got. Michael Douglas plays Hank Pym, a whizz scientist who created the original Ant-Man suit and serum that allowed him to become small and large at the touch of a button and commit acts of derring-do during the Cold War. But unlike Tony Stark, Pym realised the tech was too dangerous and could fall into enemy hands and so suppresses it. But sadly, our evil villain Darren Cross (Corey Stoll - HOUSE OF CARDS) has forced Pym out of his own company and resurrected the Ant-man tech, which he plans to sell to Hydra. This forces Pym to search out our Scott Lang (Rudd), a petty thief, and to train him up to become a new Ant-Man. (In a plot move taken entirely out of THE MASK OF ZORRO). Ant-Man Mark 2 can then destroy the Yellowjacket suit and stymie Cross' plans. In doing so both Lang and Pym can regain the respect and trust of their daughters. There's nothing explicitly wrong about the film. It's well-made, polished, action-packed. It's just that it's devoid of zing, and fun, and I don't care about any of the characters. I guess it was bound to happen sooner or later. Marvel was bound to create a clunker. Just a shame it did so when there was a potentially better movie out there. ANT-MAN has a running time of 117 minutes and is rated PG-13. The movie was released earlier this year in cinemas and is now available to rent and own.